Women determined to succeed presents "Women of the Ages" who left their indelible mark on the world through art, music and great courage to live life to its fullest and at the same time in some instances save the lives of women, men and children who were in peril. It’s not her signature owl-shaped glasses that adorn her venerable face that gets your attention and it’s not her mix of haute couture with hippie trimmings that makes you gawk in admiration. No, it really isn’t any of these adornments that attract you to her. It’s the sheer magnetism of her personality, her drive and her unending creativity that makes her a legend in her own time, a woman so determined to succeed that she is the subject of a string of museum exhibitions, a coffee table book and even a fashion advertising campaign. This geriatric starlet’s charisma, a blend of her iconoclastic style, youthful passion, energy, drive, ambition and determination are the right kind of ingredients to inspire a new generation of designers or anyone, for that matter, who wants to be judged as an innovator. POLLY MEETS MS. APFEL It was in 2005 and the Metropolitan Museum of Art in New York City premiered an exhibition about Apfel titled, “Rara Avis (Rare Bird) and indeed, I was delighted to meet this rare bird and overwhelmed by the sheer magic of the collection on view---a hodge podge of the most imaginative way of dressing from Apfel’s collection of clothes, accessories and furnishings, which she had acquired during her travels. 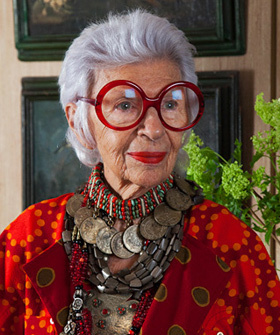 Her collection reflects pieces that commemorate high points in her life and is lavishly documented by photographer Eric Boman in “Rare Bird of Fashion: The Irreverent Iris Apfel. BECOMING IRIS APFEL Who would have ever suspected that Iris Barrel born in Astoria Queens, August 29, 1921, would become the darling of the fashion and art world. Sadye, her Russian-born mother owned a fashion boutique and perhaps Apfel acquired her passion for fashion there. Her dad Samuel Barrel’s family owned a glass-and-mirror business. Did she stand in front of one of them on day reciting, “Mirror, mirror on the wall what is in store for Iris? ?” Preparing for her passion for art and fashion she studied art history at New York University and attended art school at the University of Wisconsin and at one time she worked for Women’s Wear Daily, where I had honed my skills as a writer. Alas our paths never met. Her tenure at WWD was way before I arrived but she had left her mark and was not forgotten. TRAVELING WITH CARL In 1948, she married Carl Apfel and two years later they launched the textile firm, Old World Weavers and ran it until they retired in 1992, all the while traveling to exotic places where Iris found treasures that she would interpret into her own design. However, Apfel was not the retiring kind of dame. Off she went taking part in several design restoration projects including work at the White House. Now she is peddling her own designs on the Home Shopping Network and finds time to work on numerous charity benefits. And, get this my dears; she is a model for MAC Cosmetics. You go get ‘em Apfel! This country needs more high spirited women like you to remind us how to have fun and turn the ordinary into something marvelous when you’re young and ninety. Polly Guerin is an author/poet with four textbooks and 2 video productions as credentials as well as 4 books ready to be published. All my blogs are intended to become the basis for books to be published. PollyTalk From New York (c) is a current events blog about happenings in New York City. I have been PollyTalk columnist on the Internet, Big Apple News Network. AmazingArtDecoDivas blog features amazing women of notable character. I am on the board of the Art Deco Society of New York. The Fashion Historian blog gives pertinent insight into Polly's consummate knowledge about fashion history. Former professor at the Fashion Institute of Technology. Awaken Your Sleeping Beauty blog gives you pertinent information about holistic remedies for health, beauty, mind, body and spirit. I am on the board of the Edgar Cayce New York Center. I sing with the St. George's Choral Society and also serve on their Board. My little dog Colby is a rescue dog and I support animal charities. I hope you enjoy my blogs, please keep in touch.